The World Cup, quite naturally, continues to be a mixed bag for Asian participants, but fair to say, all performances in the Round 2 were, to an extent, at least respectable if nothing more. Saudi Arabia gave Uruguay a proper run and even South Korea are still technically in it, despite another loss and sub-par effort. And as the Asian sides enter final round of fixtures with a fine return of 8 points (equalling their third-best WC points total from 1994), Martin Lowe, Tom Danicek and Tim Lee look back at the Round 2 action. Small improvement, yet same shortcomings see Saudi Arabia exit the tournament early. Anything can reasonably considered a positive after an opening day five goal reverse, however there was a renewed sense of belief in Saudi Arabia’s performance against Uruguay on Wednesday. Despite a noticeable change in attitude, two defeats from two matches sees Saudi Arabia exit the tournament prematurely with speculation swirling around their coach’s future. As highlighted last week, Saudi Arabia’s deficiencies against Russia were of their own making. Persisting with a possession based system from the goalkeeper forward, even when it clearly wasn’t working extenuated matters in Moscow, so upon travelling to Rostov for their second match a tailored outlook was required. Juan Antonio Pizzi talked up an improved performance ahead of the match rather than contemplating a result that may keep them in the tournament, in the end both only slightly missed the mark. The opposition were better suited to Saudi Arabia’s game plan for sure; Uruguay are clearly dependent on their front two, and so sacrificed a body in midfield at expense to keep Cavani and Suarez fixed in attack. This also aided in last week’s deficiency of leaving by defeault the Saudi defensive duo on the ball for far too much of the time, instead being forced quickly to navigate it to the midfield. Again the central trio worked brilliantly in possession, Abdullah Otayf in particular having a fine match in ball recycling, but their trouble in transition persisted. The lack of service to frontman Fahad Al-Muwallad was painfully poor, often left isolated against physically superior centre backs. While the central midfield three have continually showed their technical ability on the ball, their willingness to join the attack and gamble has rarely, if ever been there. The dynamic counter attacking football we came to believe we would see in Russia has woefully fallen short against sound but far from impenetrable defensive tactics. There were personal highlights; Ali Al-Bulaihi stepped in admirably for Omar Hawsawi in central defence and infuriated Luis Suarez for the most part, while fellow change Hattan Bahebri was arguably Saudi’s brightest attacking talent, offering a direct progressive approach dissimilar from his teammates’ too often safety first approach in possession. The lowlights were pretty clear to point to also; the attacking duo of Al-Muwallad and Al-Dawsari were regularly frustrating, while goalkeeper for the day Mohammed Al-Owais will want to erase this match from his memory early, after his ill judged and missed take from a corner lead to Uruguay’s winner. The South Americans, who rarely needed to put pressure on the Saudi’s after that were far from stretched, leaving a sour aftertaste to think of what could’ve been. Amiri nutmegged Piqué on his 100th cap, it was even more tremendous than it sounds, and I want him to marry my daughter eventually. Also, Iran as a whole were tremendous. Since becoming an #AsianFootballPassionate, I’ve only been proud of an Asian side coming up against a top international side three times. First, it was Iran vs Argentina at the last World Cup, when I fell in love with both Hajsafi and Dejagah. Second, it was the Iraqi samba vs Brazil at the Rio Olympics. And now this. All those games have quite a few commonalities, and the cynic would probably pick the “no goal scored”. But that would mean missing the bigger picture by a long distance. These are stories of compactness and bravery beyond belief. There was so much to admire about Iran that I don’t even know where to start. I liked those cynical little fouls that get the job done but don’t warrant a yellow at the same time. I liked how Azmoun committed as many fouls as the double pivot of Ebrahimi and Ezatollahi in the first half, sacrificing his own offensive contribution for the greater good, dsitracting Spain. I liked the not-at-all static 6-2-2 defensive set up that just clicked; despite Spanish attacking players not really having any sort of an off day (Isco was really good, Iniesta good, Silva okay). I liked the relatively little amount of last-ditch defending; because this was a proper, well-designed plan being executed by communicative, intelligent, brave individuals, out of whom one centre-back was playing his first competitive game for Iran (Majid Hosseini) and all the other players bar Hajsafi were starting only their second World Cup match at most. I liked the fact that as many as thirteen Iranians contributed with at least one clearance and Milad Mohammadi managed to put together four successful tackles within only 22 minutes he got to spend on the pitch. I liked how Mehdi Taremi vindicated Queiroz’s brave decision to drop Jahanbakhsh, as he essentially defended for his right back Rezaeian at times, chipped in with three clear tackles, many other interceptions and clearances, and yet got himself at the end of two crosses. I liked what Ezatollahi brought back into the line-up with him; two vital blocks, five clearances including one off the line, poise on the ball, a cheeky overhead kick inside his own penalty area,… pretty much everything and arguably his best performance in the national team jersey. Sadly, Ezatollahi also symbolizes the one bit I didn’t like from Iran. 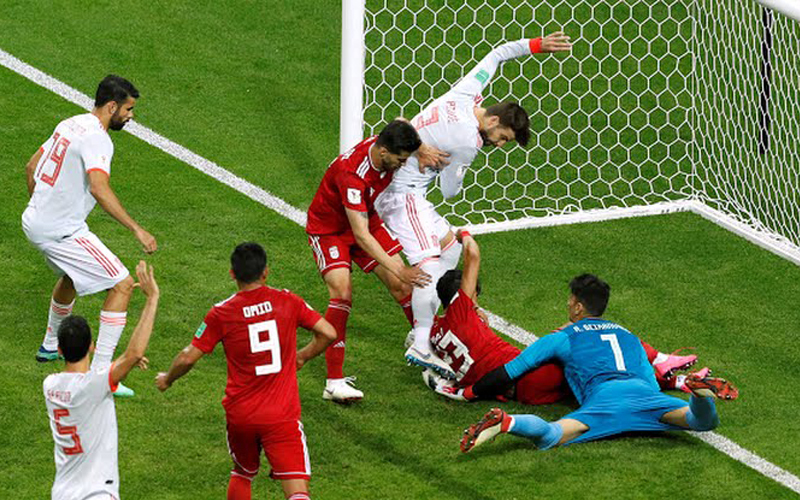 It was his overcommittment to a lost cause of a battle for the ball with Iniesta that allowed the unlucky goal and topped off a series of pieces of distracted defending early in the second half, when it seemed that Team Melli let the belief they could actually hold on vs Spain cloud their collective judgment. However, I once again liked how Iran reacted. How it was fairly obvious they indeed do enjoy some chemistry on attack, contrary to the popular belief that they can only park the bus. Three passes and on we go, throwing the 2010 World Cup champions off their game completely. Carlos Queiroz may have reacted better himself, inserting Jahanbakhsh on the pitch a tad earlier, but well, you can’t get everything spot on, I suppose. Even when you’re Carlos Queiroz. Missed opportunity sets up crucial last day to keep Socceroos’ knockout hopes alive. It’s a case of deja vu following the Socceroos at a major tournament. The performances in the main are promising, neutrals are warming to the positive, forward thinking style Australia have regularly illustrated over the last two World Cup and Confederations Cup campaigns, however the results aren’t coming. The curse that haunted Ange Postecoglou has spilled over into the perceived results specialist Bert van Marwijk, leaving progression out of their hands going into the final round of fixtures. The match against Denmark was always going to be a potential turning point for both teams’ progression hopes. While Peru are the neutral favourites, the physical advantage and mental experience of both the Danes and Aussies means that this match would always likely decide who would join France in the knockout stages. In the end, while both sides clearly weren’t happy to settle for a point a piece, that’s what they got, leaving the script wide open for a final day push. Australia’s performance categorised the cliche “a game of two halves” perfectly. First period, Denmark initiated play, created space for their talisman Christian Eriksen behind Australia’s midfield, and pushed their full backs high up the field. While Eriksen’s opener couldn’t have been attributed at the door at any of the Aussie defensive block, the speed and ingenuity were a calling card of their early exchanges. Josh Risdon, who again looked Australia’s weak link at right back was regularly out run by Pione Sisto and the overlapping Jens Stryger Larsen, while Aaron Mooy and Tom Rogic found it difficult to link up in the centre. The fact Australia went in level, thanks to yet another penalty goal from captain Mile Jedinak was one thing to be thankful for. The Aston Villa man has scored Australia’s last five competitive goals, all of which have come from set plays. From a reliance on Tim Cahill or Mile Jedinak to score the goals back at the start of qualification, the Socceroos have focussed even more of late onto one particular player. The second period saw better open play creation; Tom Rogic started to work the ball quickly in transition, Aziz Behich was finding room down the left, while Matt Leckie had a truly talismanic period both in an attacking sense and a defensive. It’d be a considerable achievement to pick out a man more consistent than the Hertha Berlin winger, who has arguably been Australia’s best performer in each of his five World Cup appearances to date. Ruefully for their performance, and a promising late cameo from Daniel Arzani, engineering goalscoring opportunities fell short; there were some promising efforts from distance (Mooy and Rogic went close), yet nothing clear cut to suggest Australia were hard done to to come away from Samara with only one point. The hot takes, and no doubt the forthcoming build up to Peru surrounds the personnel deployed. The striker position continues to split the Australian football fraternity down the middle, it seems nowadays either you’re harking back to the goals of old of 38 year old Tim Cahill or you trust more in the all round packages of Tomi Juric and Jamie Maclaren. With Andrew Nabbout’s shoulder injury likely to keep him out later this week, one side of the debate is likely to get their way. The same divisive nature is apportioned to the inclusion of winger Arzani from the start. Possibly foolishly disregarding Kruse’s all round game, Arzani’s highlight real is tantilising viewing from the bite-size snippets we’ve been afforded to date, but is this illustrative of the package he can offer from the get go? When the starting line-up came out, it appeared that Shin Tae-yong had outsmarted himself again, opting to play a weird 4-4-1-1/4-2-3-1 formation with the creative midfielder Lee Jae-sung as a second striker and starting the highly untested Moon Seon-min over “cocky-hot-shot-turned-quiet-team-player” Lee Seung-woo. Another Shin starting XI, another untested line-up. But in truth, it wasn’t all that bad. Moon’s energetic running was used to try and keep up with Gallardo, while Lee’s central role had him more involved than against Sweden. Son had legitimate opportunities to run at pace, link-up and score – 91% completion, 7 attempted take-ons, 8 shots. Indeed, it was just following one of these opportunities in the 25th minute, when Son had not one but two shots blocked, that led to Mexico opening the mark. A counter-counter attack, several botched attempts to clear or to stop the transition with one of Korea’s innumerable fouls – and then the infamous Jang Hyun-soo handball in the box. No need to slide into a cross. Certainly no need to slide with your hands up, almost begging to be reprimanded. Penalty. Vela sent Cho the wrong way. Simple as. Korea tried continually to ramp up the pressure, finishing the first half and beginning the second with much more urgency. Shin’s belated substitution to bring on Lee Seung-woo for Joo Se-jong should have given the Taeguk Warriors a real chance in the last half hour. Alas, Ki Sung-yueng made an ill-advised run with the ball forwards (ill advised as Shin had just taken off his defensive cover, Joo, and just issued new tactical instructions) and was dispossessed. Mexico took the ball away on another devastating counter and it was that drunkard Chicharito that took advantage of another random Jang tackle in the penalty box – literally waiting for the FC Tokyo defender to slide himself out of the play – before squeaking the 1v1 chance under Cho’s arm. Replays show that Ki was very clearly fouled, which directly led to the attacking phase – the counter-attack – for Korea’s goal. VAR, explicably absent. Commentators, fans, even former referees baffled – how was that not reviewable? In any case, the “Let Korea be Korea” adage that had been advocated for was listened to – mostly. The side was more attacking, more open, more willing to leave space at the back. However, chances still didn’t come easy. It was still all too Son-reliant. Lee Jae-sung’s strengths weren’t fully honed in a very narrow role. Hwang Hee-chan had less than 15 passes all game. Ki Sung-yueng was pretty good, but still at times looked much too conservative, while Ju Se-jong was not great, and at all times much too wasteful (20% less pass completion than his partner in midfield). Korea was more like itself, but still a shadow of what it could have been under a better cycle. President Moon Jae-in (and the First Lady)’s visit to the locker room gave a nation a look at the desolation of the players. The dejected and embarrassed Jang Hyun-soo, who promptly deleted his social media accounts post-game, the long face of the injured Ki Sung-yueng, who likely played in his last World Cup game, and the gasping tears of Son Heung-min, whose ‘heroics’ came far too late to mean anything but consolation. Though the President encouraged the team onwards, a nation is disheartened and already wondering if the infamous “yeot” (toffees) will be hurled at the team again upon their arrival home. This game might well be interpreted as some great vindication of the actions of the man who had contributed most to the fall of Vahid Halilhodžić, Keisuke Honda. His goal, after all, gave Japan a well-deserved point, while the iconic midfielder himself became the first Japanese player to score against a side from each continent and, of course, at three different World Cup editions, as well as the first Asian ever to have scored and assisted a goal at three Mundials (following up on Asamoah Gyan as the sole African to date to do the same). 1) These Samurai Blue may be the closest to a free-scoring Japanese side at a World Cup (bagging two goals in both opening games for the first time ever), while also arguably challenging the 2010 Japan for the mentally and physically toughest side at the same time. Yesterday, Japan had fallen behind twice to eventually emerge with a point nonetheless, which has not happened before at the biggest stage (out of 10 previous opportunities, Japan have only recovered on one occasion, in 2002 against Belgium in another 2:2 draw) and barely anybody saw it coming this time, after all that happened just weeks prior to the World Cup. The physicality of this team, on the other hand, must be nothing surprising to each and every JNT follower, as not even a back line featuring Tulio Tanaka arguably wasn’t this muscular, this strong. 2) Yuya Osako may be the closest Japan ever come to having a Giroud up top. He does all the right things in the build-up – bringing some top notch hold-up play to the table which no other Asian side has so far presented in Russia, along with the delightful backheel pass in the run up to the Inui crossbar – yet disappoints ever so often when finishing things off. Despite that one horrible miss, Osako remains a smart, combative striker who deserves the starting spot and Akira Nishino deserves some praise for giving him the unfashionable vote of confidence. While it’s still baffling Yoshinori Muto has received zero minutes of game action at this tournament, I would now rather have him coming in at the right wing. Fielding a proper target man worked wonders for Japan at the 2011 Asian Cup and this little Maeda flashback so far feels quite nice. 3) Gaku Shibasaki may indeed be the new Yasuhito Endo. Nishino’s initial team selection contained only two (pleasant) surprises, Shoji slotting in alongside Yoshida and Shibasaki partnering Hasebe instead of Yamaguchi. And while Shoji has been a decent presence at the back, the Spain-based midfielder has been nothing short of difference-making one in midfield. The gliding set-piece deliveries to the far post, the precise diagonals, the positive thinking every time he receives the ball, his head always held high and looking for options… refreshing. While I am not fully convinced by Hasebe at this tournament, as he seemingly struggles to make the right decision on the ball quickly enough this time around, Nishino arguably struck the best central midfield option at the very beginning of the tournament, which is always important and potentially makes for the key backbone of any future success to come (and which is also something Shin Tae-yong, for example, couldn’t deliver for South Korea). 4) Nishino may need to reconsider Haraguchi as a starter. Mercifully putting aside the horrible header prior to the first goal conceded, Haraguchi has so far mostly contributed in the air (with some knock-down headers) and defensively as a support for Hiroki Sakai, whereas he barely enjoys any chemistry with his fullback going forward, too often positioning himself behind an opponent and forcing Sakai into turning the ball over or going for a safe backpass. You also don’t see Haraguchi interacting too often with Kagawa, who pretty much completely disappeared after the break. Therefore, if you’ve got Hasebe largely operating as a third centre back anyway, Nishino may want to roll the dice with Honda as the false right wing, which is the single position where he’s consistently managed to perform at a high level for Japan. Haraguchi did make the difference for Japan at many points during the qualifiers, but did so in a differently oriented setup; more centrally and with Kiyotake as his favourite partner in crime.